I took a walk to the boatyard today. It was snowing a little and there was about half a foot of snow on the ground. 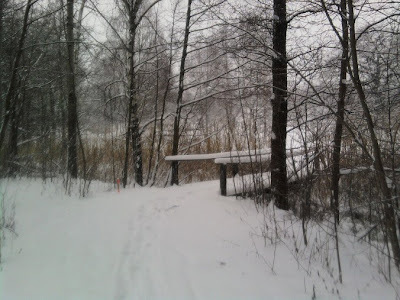 It would probably have been easier if I'd had a pair of skis. 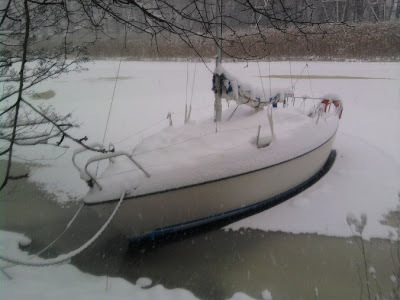 After having removed about a ton of snow from the boat's cover I walked home and it started to snow really good. After having made it to the subway station the adventure got a bit out of hand. First there was a big bang and a flash of lightning, then the train stopped in the tunnel. A voice came on the loudspeaker telling us that the train probably had lost a current collector shoe and wasn't allowed to continue until inspected. However, a few minutes later she told us she'd try to back the train to the previous station. This succeeded and I was once again out in the snow. Shortly after I was hit by a lump of snow or ice descending from a roof. It missed my head by inches and bumped off my shoulder. It really is much safer at sea! Ah, and don't do this to your boat.